I love end-of-summer tomatoes. They’re sweeter, softer, and more flavorful after soaking up months of heat and sunshine. And though it’s hard to beat nature’s handiwork, I’ve developed a method of making them sweeter still. At Vetri, one of my restaurants in Philadelphia, we roast thick slices of ripe tomato in large batches overnight, letting them cook slowly in the residual heat of the ovens and then in the warmth of the pilot light. 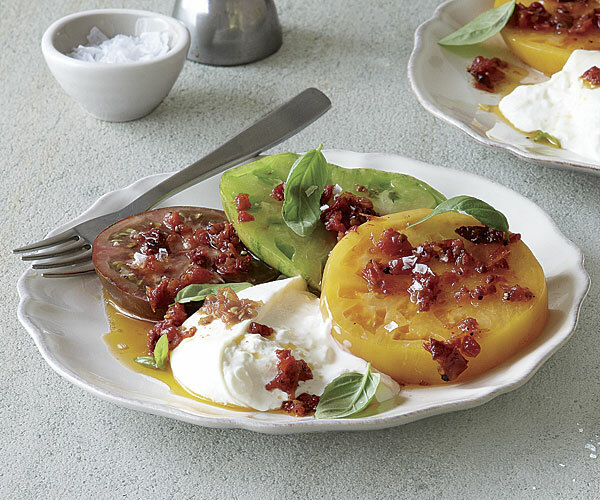 In the morning, the tomatoes, which do not completely dry out, look wrinkly and lightly caramelized in spots and have a flavor that’s rich, deep, and sweet. This tomato “conserva” (see below for why I put conserva in quotes) is delicious on its own as a condiment for just about anything grilled, but we also use it as a not-so-secret ingredient wherever we want to add intense tomato flavor. 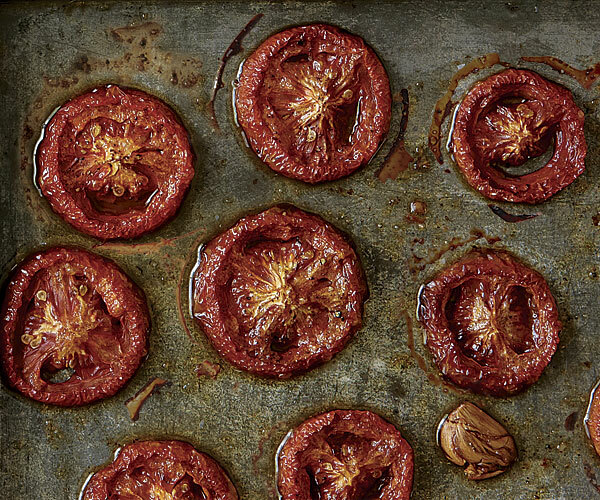 My restaurant technique is easy to duplicate at home: Simply toss sliced tomatoes with a little olive oil, garlic, salt, and pepper and spread on a baking sheet. Start them in a moderately hot oven and then slowly roast until they look like the ones at right—5 to 6 hours should do it. You can use whatever tomatoes you like, but meatier ones, such as beefsteaks or plums (romas), work really well. 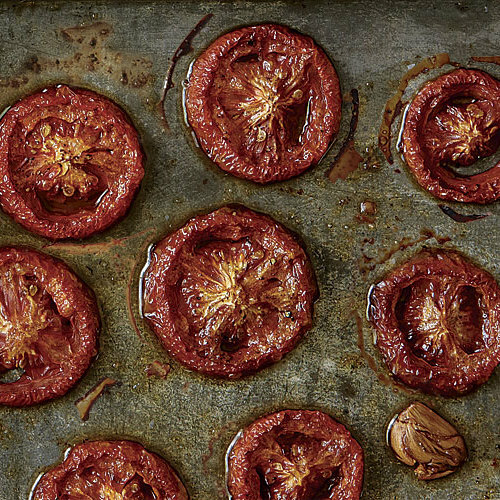 Some people might suggest that summer is not the time for slow-roasting tomatoes—after all, they’re so good raw at this time of the year—and that this method should be saved for boosting the flavor of lackluster winter tomatoes. I could not disagree more. By starting with tomatoes at their best, you get the best tomato conserva. Sure, you can make it in January with out-of-season tomatoes, but it won’t be nearly as good as the conserva you make in summer. Plus, making tomato conserva is a good way to use up all those tomatoes from the garden. 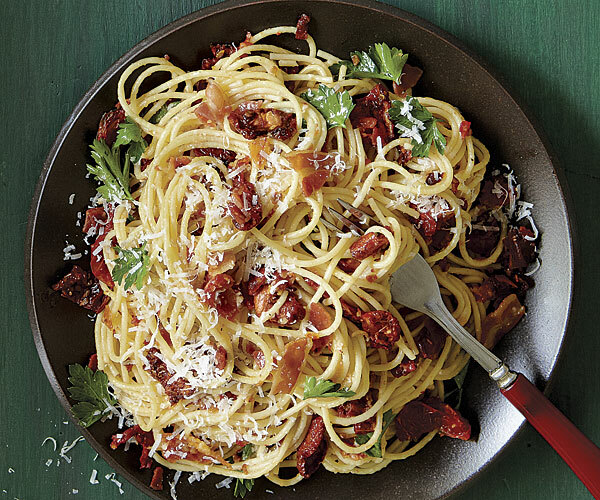 Tomato conserva is endlessly versatile. 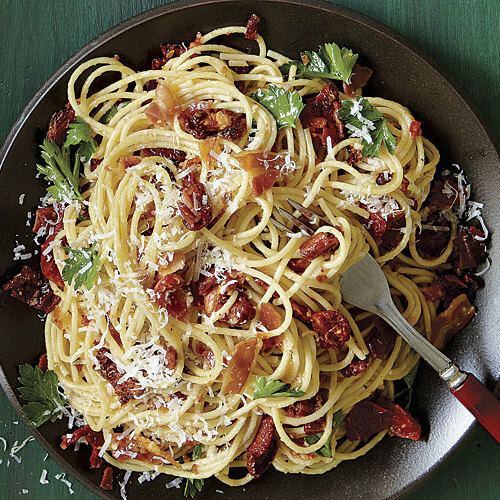 In the recipes that follow, I use it in place of canned tomatoes in classic pasta all’ Amatriciana, where the conserva’s sweetness plays off the spicy crushed red pepper flakes and salty pancetta. 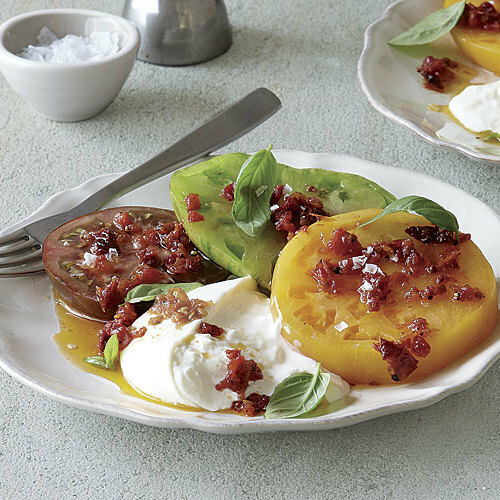 I also use it to make a vinaigrette that I drizzle over colorful slices of heirloom tomatoes and Burrata cheese for the ultimate summer salad. Beyond these recipes, tomato conserva is delicious on pizza, over polenta, or added to a spinach or bread salad. It’s great on sandwiches or alongside them, like a relish. At my more casual restaurant, Alla Spina, we serve a tomato conserva as a condiment for our Taleggio and roasted pepper grilled cheese. And one of my favorite casual suppers consists of topping grilled bread with some tomato conserva, fresh goat cheese, chopped thyme, and a fried egg. I also make a sweeter version of tomato conserva by omitting the garlic and sprinkling the tomatoes with some sugar. Sweet tomato conserva is fantastic over pound cake, olive oil cake, or ricotta cheesecake. I also love it chopped and spooned over olive oil gelato or even good old-fashioned vanilla ice cream. You’re bound to find your own favorite ways to use tomato conserva once you make it yourself (and it’s so easy, there’s no excuse not to). Just don’t wait until winter. Italian cooking aficionados might rightfully note that in Italy, a tomato conserva is more like a tomato paste. I call these tomatoes “conserva” because their texture is like a conserve (a whole-fruit jam). The method is also a way of getting another week from really ripe tomatoes. And though I go through conserva so fast that I don’t need to do this, you can freeze roasted tomatoes for a couple of months, “conserving” them for winter. You know when you lift a potted plant and it’s really light, it means the soil is dry? It’s the same with a tomato. If it’s heavy, then it’s nice and juicy, and vice versa. So pick one up to feel its weight. Then bring it to your nose. Even from the outside, it should have a strong tomato fragrance; if not, put it down and keep looking. For making conserva, you want tomatoes that are ripe but not mushy; save the mushy ones for the saucepot.